A few months ago, a member of the Ravelry Loom Knitters Group spied an unusual loom on Ebay in France. The seller was Spanish, so one of our members who spoke Castilian Spanish offered to help translate. The result was the discovery of "The Spanish Looms". We've affectionately named them the "Elivra Looms" after the very nice lady who sells them. What are these mystery looms? Well, at first glance, they looked like copies of the basic Knifty Knitter looms, in very pretty colors. But, what peeked everyone's curiosity was the extra holes between each of the pegs. And, there were extra pegs to put in them. So, we were looking at looms in a smaller gauge, with an awful lot of sizes, at reasonable prices. When the first batch arrived, our hopes were confirmed. The looms were indeed about a 3/8 inch gauge when the extra pegs were added. There were 9 looms, 4 long and 5 round. Unlike the Martha Stewart looms, the pegs for the Elivra looms snapped into place evenly, with the grooves automatically facing outward. The pegs are about the same size as the small Martha loom pegs. The plastic was smooth, but not slippery, and the looms were sturdy. The colors were fun, with a translucence that made us want to find a way to put lights inside of them. The group next placed a bulk order with Elvira, and ten members received the wonderful looms. So far, everyone is delighted with them, so it seemed time to tell you all about them. Small pink : 20 pegs. Almost 1/2 inch gauge. Green : 44 pegs. 3/8 minus 1/32 inch gauge. Purple : 62 pegs. 3/8 minus 1/32 inch gauge. Blue : 72 pegs. 3/8 inch gauge. Big rose : 82 pegs. 3/8 plus 1/32 inch gauge. All have a 3/8 plus 1/32 inch gauge. 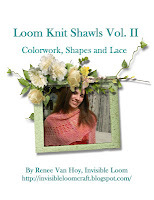 A huge, free, wonderful database just for Loom Knit patterns on Ravelry. Up until two weeks ago, Ravelry had a pattern database for knitting and crochet patterns. Yes, there were many loom knit patterns in the database, but they were hard to locate, and not really part of Ravelry. With the new database, in just barely two weeks, 650 patterns are now in the "loom knitting" category, and there are another 200 soon to be added. What does this mean? It means you may go to Ravelry and easily search the database. 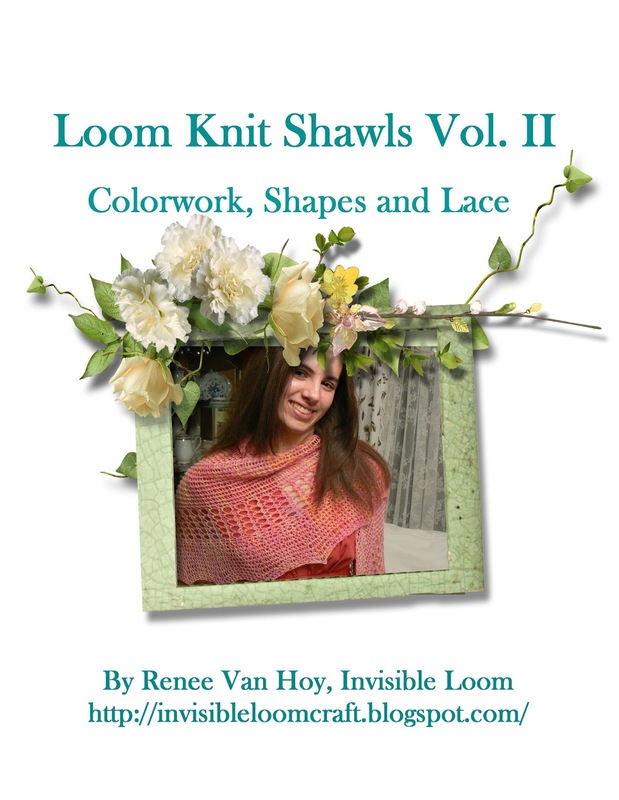 You will find patterns, books, and best of all, projects made by other loom knitters. Yes - Ravelry not only added patterns to the database, they gave us a loom knitting project catagory, too. 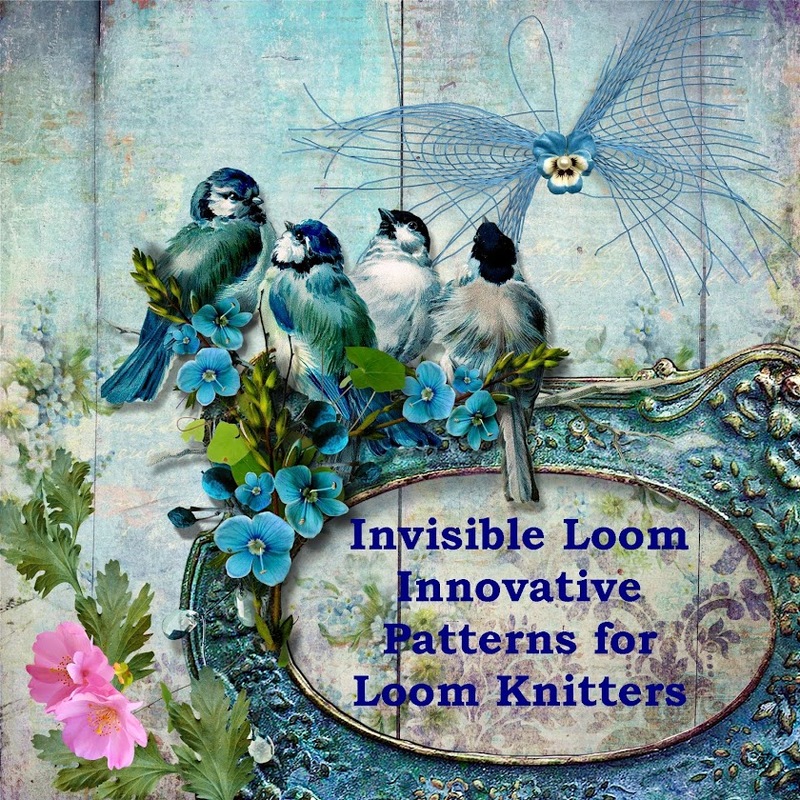 Now it is up to the loom knitters and designers to build up this database, add their projects, link them to the patterns, so we have a wonderful place to look for loom knitting information and patterns. And if that wasn't enough - there are new looms this month! My very favorite, CinDwood Crafts, has added a 5/8 inch gauge (the same gauge as the old round Purple Knifty Knitter Loom). The looms are special order only at this time. This gauge comes in sets of 4 round looms, for the same cost as the 1/2 inch looms. Kiss Looms has just released an extra fine gauge, 3/16 inch loom, in two sizes. It is a little different from the other Kiss looms, as it only has the front pins, no back row of pegs. The loom is adjustable, too. It is great to have an adjustable, extra fine gauge loom available. Now for the Loom-a-long updates: the "On-going Leafy Sea Dragon Scarf" loom-a-long continues to be very active, with lots of ruffles being made. The Fingerless Mitts Quest continues throughout June, and the new June/July loom-a-long is a darling pair of striped pants from Bethany Daily's wonderful book "Loom Knitting for Little People". 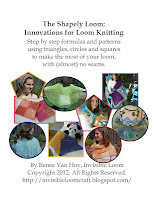 You may read about all of the loom-a-longs and join in at the Ravelry Loom-a-long group.